The month of March is here! The age-old question: "Will March go in like a lion and out like a lamb?" will be asked over the next few days. With all of the heinous Winter weather, low temperatures, bouts with influenza and general seasonal sadness, I'm absolutely ready for some reprieve. My Winter has been going fantastic, actually. I usually shut down my blog for four months a year (January through April) because I need to regroup, refresh, plot, plan and test recipes so I can come back full force after Spring Thaw. This year, I've decided to simply scale back and focus on smaller non-blog projects and build my personal chef business. It's really been fantastic and if it weren't for the ice and snow, I'd be doing a little better! It's important to have a familiar, simple, hearty meal on standby to help melt those Winter blues away. I'm mentally melting all of the lingering Winter snow with my grandma's pinto bean recipe. I really miss her and I know she's looking over my shoulder as I add the bacon to the pot. I usually eat it as a main meal and have no issues filling up on a meat-free, protein-filled bowl of childhood memories and do a little diced white onion for crunch. I've added my own fun twist by topping the beans with buttery, cornbread croutons. It's all of the flavor with none of the commitment of a hunk of cornbread that might crumble when you bite into it. This week, the Sunday Supper crew is sharing "Beantastic" recipes covering everything from appetizers to soups and stews to desserts. That's right desserts. Place beans in a large pot. Add enough water to cover by 4 inches. Let soak for 8 hours or overnight. Drain beans. Do not use the soaking water. Place beans in a large Dutch oven, and add broth and water to cover beans by 2 inches. Add more water or broth, if needed to cover beans. Add bacon, onion and hot sauce to Dutch oven with beans; Bring to a boil, and cook, uncovered, for 1 hour. Add garlic and granulated after 30 minutes of cooking. After 60 minutes, reduce heat to medium-low, to a simmer, and stir occasionally. Add more water by 1/2-cupfuls if dry, and cook until beans are tender, about 2 hours. Season with black pepper and red wine vinegar, to taste. Serve with Cornbread Croutons. Preheat oven to 400 degrees F. Put the butter in your baking vessel of choice (preferably cast iron skillet) and place it in the oven while it's warming up. Sift cornmeal, flour, salt and baking powder in a medium mixing bowl. Make a well in the center of the bowl. Beat eggs, milk and oil in the well. Alternatively, beat the eggs, milk and oil in a separate bowl and add to dry ingredients. Stir until thoroughly mixed. Pour into heated pan. Bake 15 to 20 minutes. What a fun recipe! 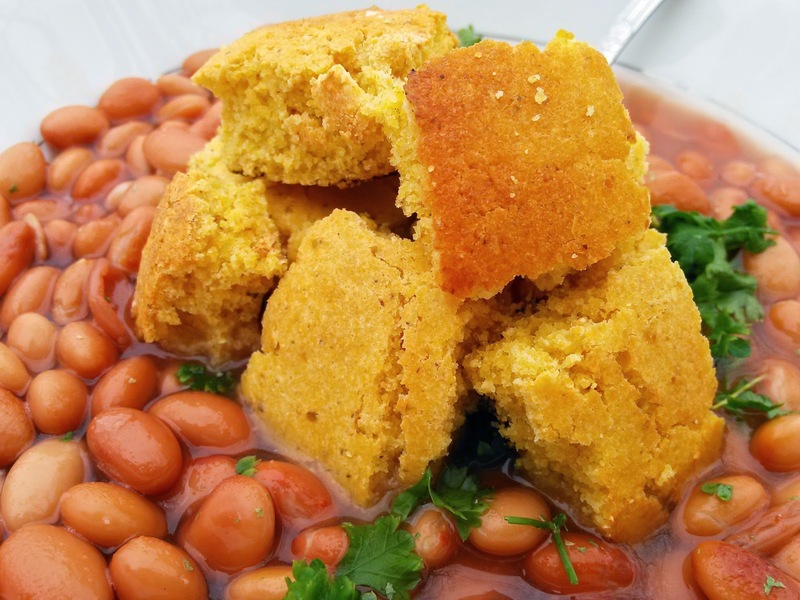 Love cornbread and beans together! Oh! Cornbread croutons - brillant! What a great southern recipe. I'm not the biggest fan of pinto beans but I'd be willing to try this recipe. Especially when my in-laws from AL come to visit at the end of the month. 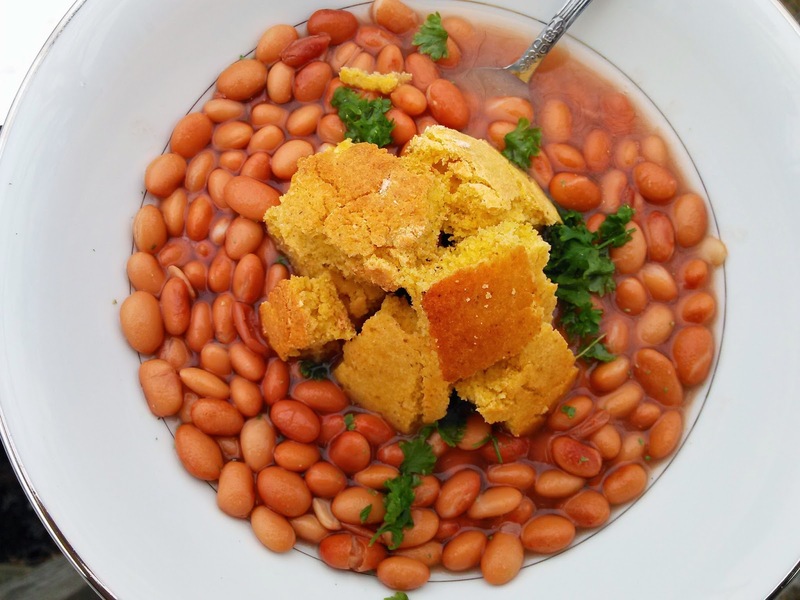 Cornbread and beans are such a great pairing! And a recipe passed down through the generations is such a treasure! My mom would have so loved this. She always put cornbread in her beans without fail. It's they way we were raised. I love the cornbread southern twist in this dish! YUMMY! I love the addition of the cornbread!!! Great southern touch! 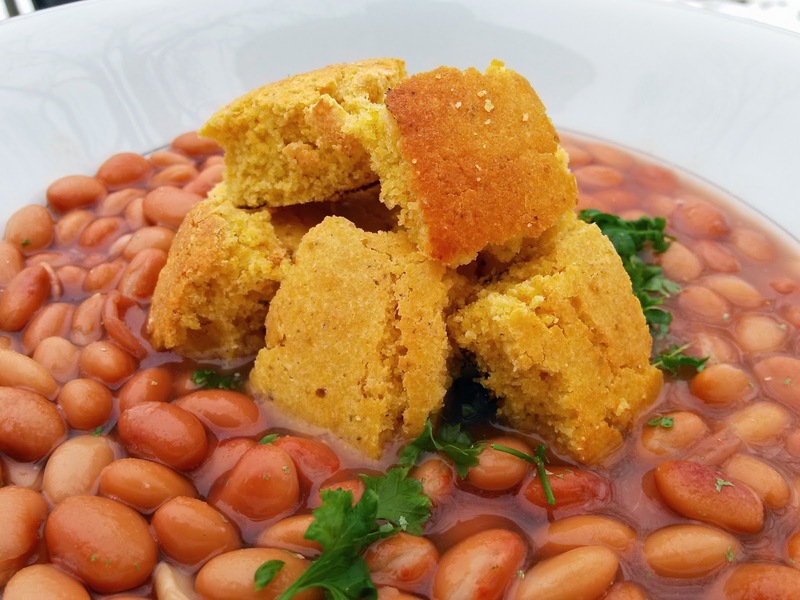 Beans and cornbread ... such a classic combination. Love your version too! I love the idea of cornbread croutons instead of a piece of cornbread. It's the little things in life. I can almost taste that cornbread soaking up the beany goodness!